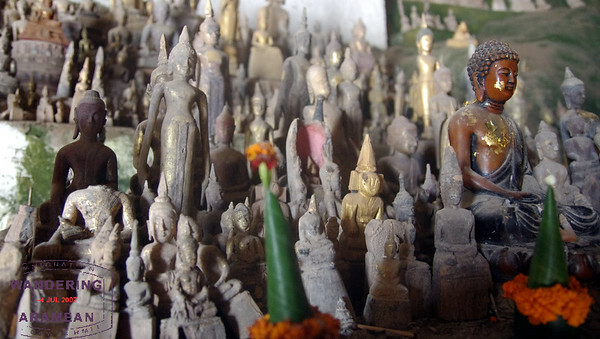 In a world where statues of Buddha dominate day-to-day life there is an important question which is often overlooked: What do you do when the statues are damaged or ready to be retired? Around Luang Prabang, Laos the answer was a voyage up the Mekong river to where the Ou river joins and a pair of caves known today to tourists as the Pak Ou caves. 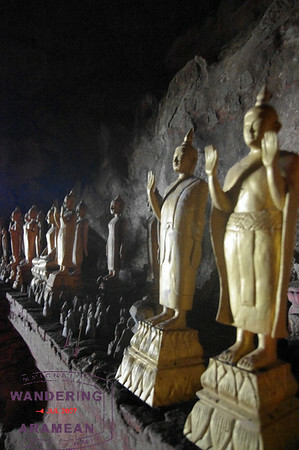 The caves have been used for more than a thousand years, accumulating quite the impressive collection of Buddha images. 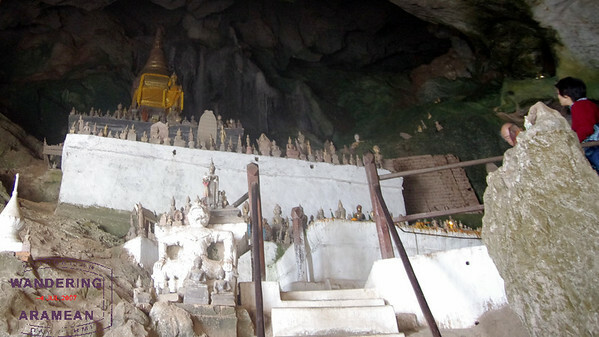 The caves have changed a bit in the 1000+ years they’ve been used as a pilgrimage site. They are still a place for reflection and prayer. 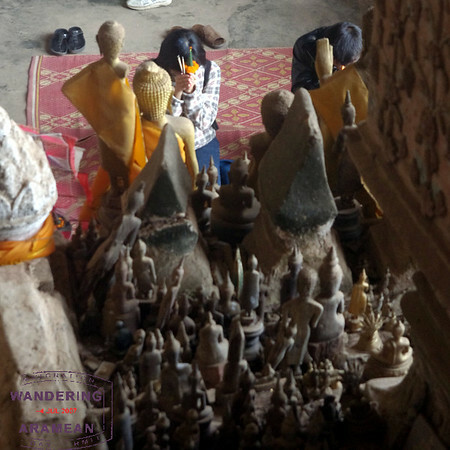 And they are still a destination where one can find hundreds, if not thousands, of Buddha images tucked in to nearly every nook and cranny around the site. 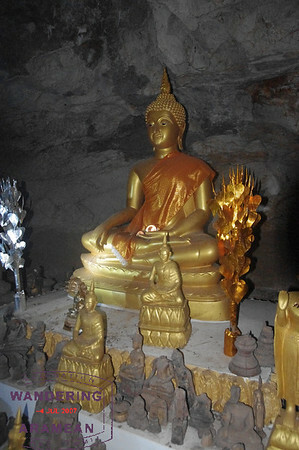 And pilgrims still bring an image to the site to add to the collection in the lower cave (Tham Ting). At the same time, however, there is now a dock at the base and ticket takers stationed at the site, welcoming the large daily influx of tourists. 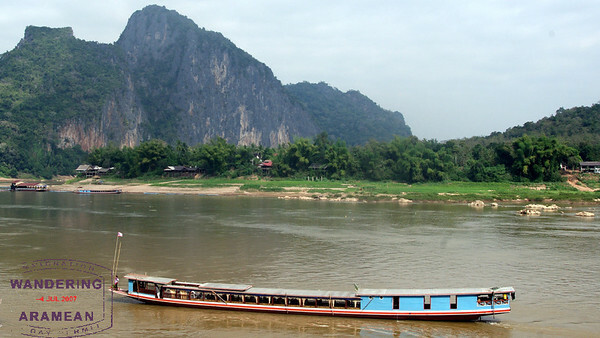 Getting to the caves involves either a 2ish hour boat ride upstream from Luang Prabang or a rather shorter van or tuk tuk ride. The boats are narrow and loud but if a nice day on the water suits your fancy this isn’t a bad way to get that experience. Once at the site there are two caves to explore. The aforementioned Tham Ting (lower cave) is not particularly cave-like. It is reasonably open to daylight and seeing the massive collection of Buddha images there can be done without too much trouble. Higher up the cliff face (just walk up the stairs to the left) there is Tham Theung, the Upper Cave. This one is actually a cave in the traditional sense. You walk in and it gets very, very dark very quickly. It is spacious inside – plenty of room to move around without bumping into anything, but pitch black at the back. It has more of a religious feel and is also less visited than the lower caves, meaning slightly smaller crowds. Combined with the extra space the relatively few Buddha images inside Tham Theung seem a bit more spiritual and "put together," at least it did to me. Seeing anything inside requires a flashlight/torch; there is a donations-supported station right outside the entrance with many to use. Like most tours a Pak Ou caves excursion involves a visit to the gift shop as part of the adventure. In this case, however, the gift shop is not at the caves themselves. Instead you visit one of the local villages along the waterfront (don’t worry; your boat driver knows which one) to see the handicrafts available for purchase. The crafts themselves weren’t particularly impressive (few are to me) but the region is also known for its production of Lao Lao, a rice whiskey. And there are free tastings at the stop. Lao Lao is not good. It burns and has minimal flavor to recommend it. Still, a small souvenir bottle was a dollar or two; I’m looking forward to tasting it compared to the Burmese whiskeys we picked up later in the trip. Definitely kitsch, but still fun. 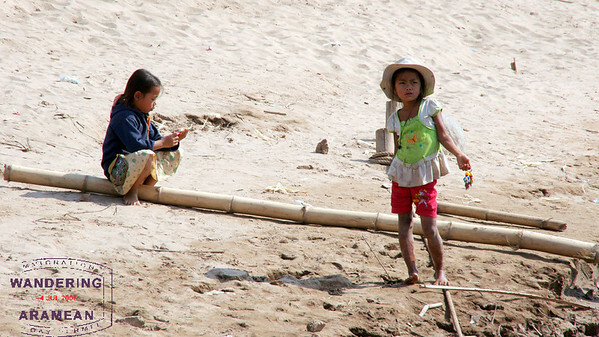 And then you sit back and relax for the rest of the return boat ride back to Luang Prabang. Time-wise the trip is very much about the boat ride. If you manage to spend more than 30-45 minutes in the caves that would be a much more significant devotion to Buddha and tolerance for crowds of other tourists than I can typically muster. Still, the trip is a good way to spend most of a day and, assuming good weather, the time on the water can be quite lovely. It can be done via roads as well, but you lose a lot of the experience that way. A few more photos from the trip can be found in the gallery here or on Facebook here. This was one of our least favorite parts of our LP trip to be honest, we were underwhelmed. we did the boat ride, it was long and uncomfortable! Was it called “lao lao”, or “lao kao”. 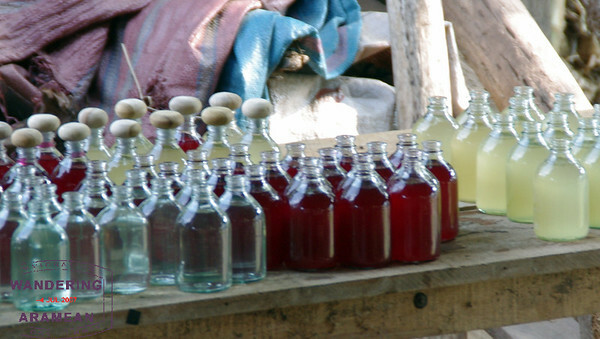 In Laotian “lao kao” is rice whiskey. “lao”=alcohol, “kao”=rice? Or, was it really “lao lao”, which depending on the intonation, could mean Lao (Laotian) alcohol? As a native who has never visited LP (on my list) – thanks for the review. Would like to hear more about what other thinks of this excursion. Agree with Andrea at being underwhelmed, although the hike up those stairs was good exercise and appreciated after it was over, I visited as part of a half day trip to the elephants on the other side of the river. The boat ride over is a quick one (i did a longer sunset cruise later in my visit), with a van ride out to the site and back. Just visited LP in early January and have to agree that the Pak Ou Caves were a little underwhelming. However, I thought Kuang Si falls were definitely spectacular. We did that later on the same day. The rice whiskey is definitely called lao lao. You can apparently get different concentrations of lao lao as well. My friend bought a small bottle of 30% or maybe 50% and we thought it tasted quite light and very sweet. Has anyone heard of stray bus in Laos? 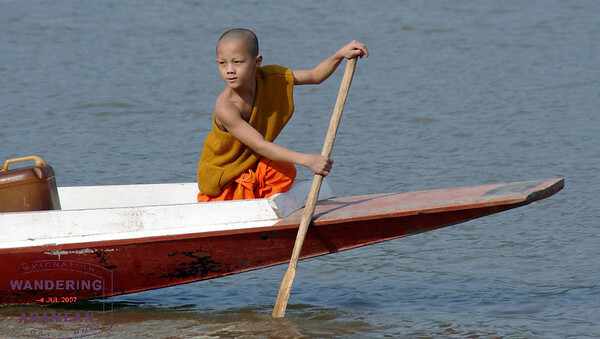 I had read so, many mixed reports of the caves that when I was there I just hired a boat for about an hour or two. We stopped at a couple of the villages. I very much enjoyed just being on the water and seeing the daily life of the locals. I’m quite surprised at the comments. 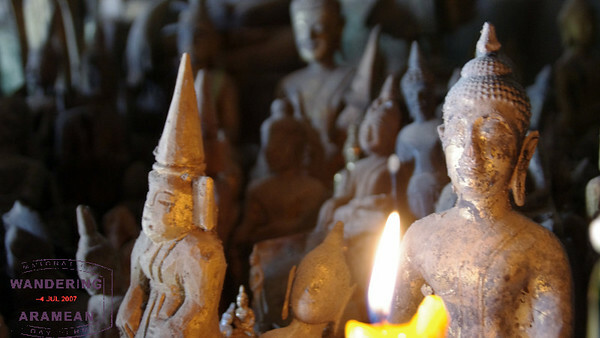 I found the Pak Ou caves to be a truly magical and enchanting experience. I would surely visit it again. When I went to Tham Theung my guide brought along a whole pack of those yellow candles you see everywhere. He placed them all around the cave. Made for some great photos and atmosphere. There is nothing to see at these caves… If you want to see true beauty, check out Kong Lor cave. I’ll have to see if I can get my hands on some next time I’m in Nong Khai.